Keep Charleston Beautiful offers collapsible metal-frame landfill, recycling, and composting receptacles to interested groups for use at special events in The City of Charleston. Keep Charleston Beautiful recently enacted a tiered fee system for our Lend-A-Bin Program. We still offer Lend-A-Bin receptacles at no cost. This is Tier 1. The event host is required to pick up the receptacle frames and lids from our office at 823 Meeting Street, as well as drop them back off. The event host will be responsible for providing appropriate bags for the receptacles (40" X 45"), and will need to properly dispose of landfill/recycling/compost waste that is created during the event. Tier 2, which does have an associated cost, offers the event host a little more assistance. Keep Charleston Beautiful will drop off Lend-A-Bins to the event site, as well as pick them up at the event's conclusion. We will also provide appropriate bags for each waste stream you choose to utilize (i.e. compostable bags for compost, clear bags for recycling, etc.). For this particular fee Tier, the event host is still responsible for properly disposing of landfill/recycling/compost waste that is created during the event. Tier 3 is the all-inclusive package. 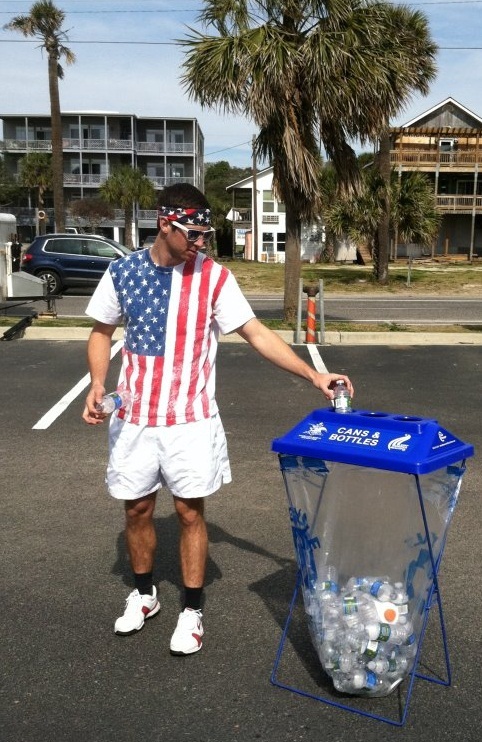 Keep Charleston Beautiful will drop of Lend-A-Bins to the event site, as well as remove them at the event's conclusion. We will also provide bags for each waste stream receptacle utilized for the event. KCB staff will be present during the event, and will recruit volunteer staff to help manage receptacles during the event and to assist event patrons in properly sorting their waste into receptacles. At the conclusion of the event, Keep Charleston Beautiful will be responsible for disposing of landfill/recycling/compost waste created during the event. If including composting options in this fee tier, the price does increase substantially due to costs associated with properly disposing of compostable material at an industrial composting facility. For more detailed information on the Tiered Fee System, check out our Lend-A-Bin Fee Chart. For more information on the Lend-A-Bin program and detailed pricing for each fee tier, please contact Keep Charleston Beautiful via Email or via phone at (843) 579-7501. If you have questions regarding recycling drop-sites or materials that are accepted please contact Charleston County Environmental Management at 843-720-7111.